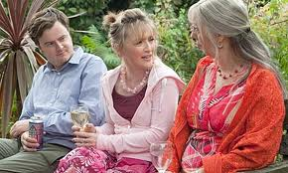 One of 2010's critical darlings, Another Year charts the four seasons of middle-class Londoners Tom (Jim Broadbent) and Gerri (Ruth Sheen) while they idle on down the road of mutual contentment. As the married couple potter about their garden share, the household peace is breached by the pitiful lives of friends and family, with Mary the secretary (Lesley Manville) leading the parade of the wretched. Like a bleeding mutt following Gerri home from the office, jittery Mary is a post-menopausal harpy who's desperate for the stability of her friends and hungry enough for a man I'd spray her with a fire extinguisher if I met her at a party. Tailing right behind Mary in the Failure Olympics is Tom's old chum Ken (Peter Wight), a shlubby wreck in track pants reeking of smoked B&H fags and spilt ale. As Mary sniffs about their adult son, the happy duo goes about their simply wonderful, wonderful, wonderful, wonderful lives together. Another Year can be viewed in duality: either Tom and Gerri exist as kind hearts who chide their loved ones for moronic choices; or maybe they're sanctimonious bastards who gain illumination and contentment from the follies of the world's Marys and Kens. The opinion of my gal had the sun shining out of Tom's and Gerri's backsides, but to me they had it both ways – I've revelled in others' lousy relationships and most likely so have you. It's a better past-time than golf and far more stimulating. I'm surprised Another Year was the highest-rated film among critics at Cannes. This doesn't speak well either of Cannes 2010 or the attending critics. The acting is mostly first-rate (I like Jim Broadbent's work in Leigh films, with his best moment as W.S. Gilbert in 1999's Topsy-Turvy) with some solid laughs, but when Mary and Ken communicate their demons to the audience it's usually shrill and transparent enough that I wondered if anybody else sharing their scenes was deaf or just slow-witted. My concerns with Manville’s and Wight's performances lie with Mike Leigh's direction and his editor for the camera takes that were selected – unless all takes featured caricatures of desperate binge-drinkers, in which case the fault is all on Leigh. If Mary showed up in her state and I was a geological engineer like Tom or a councillor like Gerri I'd have her in the back of a taxi towards a shrink with a pile of Xanax in double-time. Yet, in Another Year the Broadbent and Sheen characters remain frustratingly, unrealistically serene about Mary for most of the film. This unreality wouldn't fly in an NYU student project, and this shouldn't fly in the work of a master. Additionally, the bait of an early subplot with Imelda Staunton is dispensed as load-bearing for the theme instead of a worthy story of its own. Leigh has again also chosen to film in a 2:39 aspect ratio that's ill-suited to his comedies and dramas. Unless Ruth Sheen is going to crack open corruption in MI5 and Broadbent is off to sack Rome, perhaps the use of anamorphic lenses creates false expectations in a middlebrow film, no? Despite my grievances there is some good to this film. Another Year is available on Blu-ray from Sony Pictures Home Entertainment.